WAR OF THE WORLDS —-long before Gorgo and The Giant Behemoth blitzed London, and prior to Godzilla and his peers repeatedly flattening Tokyo, the Martians blew the bejeezus out of Los Angeles. These aliens don’t have the innate social responsibility often displayed by the Japanese lizard, nor the maternal instincts of Mrs. Gorgo, and they’re smart enough to realize that just being big and swinging your tail confines your destructive potential. 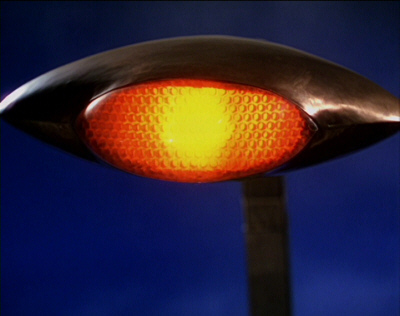 To the everlasting gratitude of loyal sci-fi legions, the invaders indiscriminately employ fiery death-rays, augmented by what are still, over sixty years down the pike, some of the most awesomely cool sound effects ever generated. 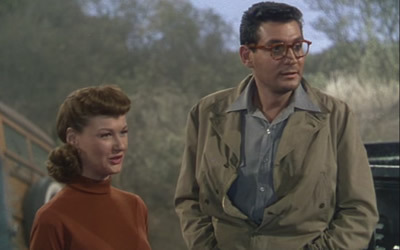 The cast of this 1953 classic do what’s required, though Gene Barry gets so intense with his yelling that it looks like he’ll blow up without push from the Martians. 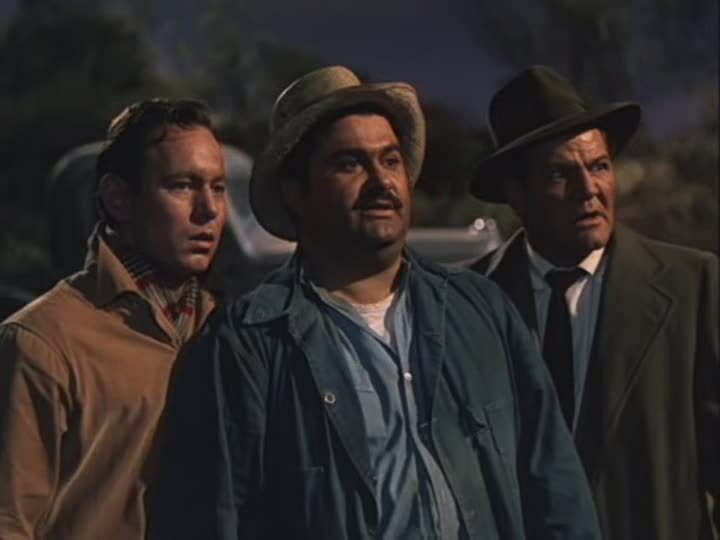 Immortality comes to three character actors—Paul Birch, Jack Kruschen and William Phipps; the first trio who greet the visitors, deciding on the phrase “Welcome to California!”—all it takes for them to get promptly vaporized. 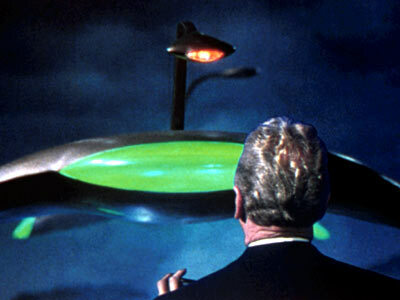 Great Technicolor, shot by George Barnes, elaborate matte work and miniatures mixed with live action (thanks to the National Guard for all the hardware), plus famed artist Chesley Bonstell contributes his wonderful renderings of our neighboring planets to kick it all off. The doom-smooth voice of Cedric Hardwicke provides opening narration. 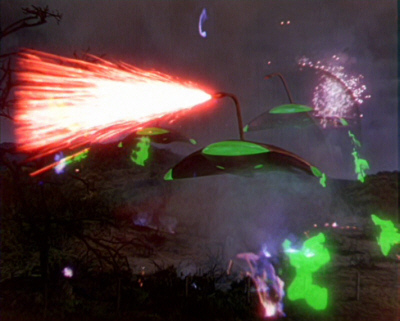 The special effects dazzle reach a 50s high-watermark in pyromania as the part manta ray/part cobra-like alien craft duel with the tanks, howitzers, rocket launchers and mortars of the US Army—were the moviemakers trying to send a message to the Russians? Some of the sound effects were whipped up by recording a trio of electric guitars and then playing it backwards. The priest who nobly (flip side of foolish) walks toward the hovering Martian ships with his Bible, reciting “and I will dwell in the house of the Lord” always has me wanting to cut in with “shortly”, considering the one-way trip he receives. No surprise that the scripting differed considerably from the great H.G. Wells novel, and if I have to be the one to tell you it had been done before on the radio with Orson Welles then you really need to seek counsel. I also liked the recent mega-budget remake (sue me), which we’ll get to in due time. With Ann Robinson (screaming hysterically), Les Tremayne, Robert Cornthwaite (the scientist who tried to reason with The Thing: don’t these smart guys know there’s such a thing as an Air Force? ), a gaggle of familiar faces including an unbilled Carolyn Jones. Byron Haskin directed the $2,000,000 gasser (prodigious outlay for its type, in its day), which was a smash hit. Oscar winner for Special Effects, nominee for Film Editing and Sound. 85 minutes for your significant other to wonder if you will ever really grow up. Let’s hope not.